"The Jarl and I have our disagreements." Brina Merilis is a Nord warrior who owns a house in Dawnstar. She is a retired Legion legate and fought in the Great War, and her former subordinate Horik Halfhand still follows her around at all times. 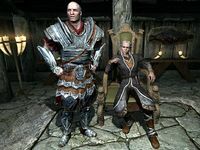 Brina will become Jarl of Dawnstar should you side with the Legion in the civil war and take control of the Pale from the Stormcloaks. If she is deposed again, she and Halfhand will take residence in the Winking Skeever. Brina: "Divines sake, Skald. Who do you think we're threatening with our old war wounds? We're not soldiers, anymore." After the argument, Brina will return to her regular duties; she gets out of bed at 8am and always starts the day with a one-hour breakfast with Horik. She then leaves the house and starts patrolling around town, obviously keeping an eye on the actions of Skald. She pauses at noon and 6pm for one-hour meals. At 8pm she returns to her house and spends a bit of time with Horik before she goes to bed at midnight. She wears upperclass attire, specifically fine clothes and fine boots. She carries a steel dagger, her house key, and a selection of common items and gold. Like all other Dawnstar citizens, Brina has trouble sleeping before the quest Waking Nightmare and will say: "You come to Dawnstar at a bad time. Tempers are... fiery." If you ask her to elaborate she will tell you: "Not a single man or woman in Dawnstar has gotten a good night's rest in days. We keep having the same nightmare, over and over. If people aren't tired, they're angry, and if they aren't angry, they're afraid. It's made keeping order a mess. I hear Mara has sent one of her priests to the inn to try to calm people down, but I don't know how much words will do now." She will also apologize for the public argument with Skald: "The Jarl and I have our disagreements. Sorry if you had to overhear one of them. ", and tell you the reason: "Skald supports Ulfric's rebellion, and he doesn't like having a couple of old Legionnaires living in his town. He's a fool. A dragon has attacked Helgen. Dawnstar needs the Empire now more than ever." She will also greet you with: "I wasn't born in Skyrim, but when I served in the Legion this land became my home." and "Horik and I have lived here ever since I retired. He's a good soldier." Lastly, she will readily provide information on where to drink and where to work: "Drowning your troubles in mead? A lot of folks are doing that these days. You'll want the Windpeak Inn. As for work, you could try to catch Skald in a good mood, but your best bet would be working in the mines. They're on opposite ends of town." "I'm fine, Horik. I just... are you worried about this war?" "Just like old times, huh Horik?" If she is appointed Jarl, she will abandon her house and move into the White Hall, still with Horik by her side as Housecarl. She holds court every day between 8am and midnight and will be quite confident with the task saying, "I will serve Dawnstar as I always have." and continue with: "You should see the grin on Horik's face now that we're in charge. I know he hides it, but I can tell." If you ask her about the safety of Dawnstar from dragons she will tell you the worrying truth: "No. We're completely exposed. Bows and arrows are in short supply. Every building is made of thatch and wood. I've given standing orders to the guards to prepare water bucket runs to the harbor in case of a fire, but that's all we can do." When asked about the war, she will sum it up: "The Empire has stretched itself too far. This rebellion in Skyrim is one problem, but solving it won't fix everything. But that's the kind of talk an old warhorse shouldn't be making. Don't worry. I have my problems with the Empire, but I'm still a soldier first. We'll keep peace and order in Dawnstar." Brina: "Madena, I was wondering if you could help me with something. Your magic would be invaluable." Madena: "If this is about battle magic, forget it. I've told every Jarl I've served under that I won't...."
Brina: "Actually, I was just wondering if you could make sure people are tended to if they get hurt. I'm sure you wouldn't object to that." Madena: "I, well, no of course not. I would be glad to help." Brina: "Thank you, Madena. I appreciate your assistance." Unlike most Jarls, Brina does not have a steward. 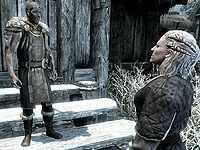 Though Brina says she was not born in Skyrim, she seems to have moved there early, as Frida's dialog indicates Brina having been a respected citizen of Dawnstar since well before the Great War. Bounty quests turned in to Brina will not be removed from the quest journal upon completion, and cannot be removed with the console. 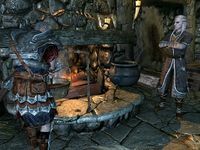 With Hearthfire, when she is made Jarl, Brina may be asked if the property she mentioned is still available, even if she hasn't mentioned it before. 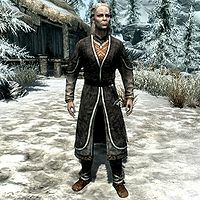 If Dawnstar is transferred to Legion control via Season Unending or completion of the Civil War in favor of the Empire before visiting Dawnstar and witnessing Brina's argument with Jarl Skald, she may stand on the steps of the longhouse permanently. This will not affect her dialog or any quest related behavior.